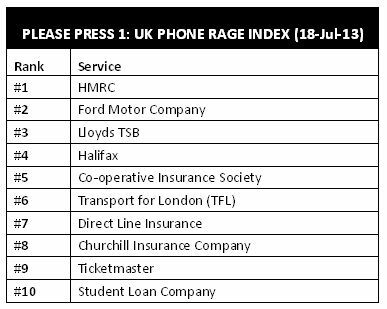 Consumer website PleasePress1.com has launched the UK’s first ‘phone rage index’. The free to access website, which charts the automated phone menus of some of the UK’s most well-known brands, is growing rapidly – over 600 services now have verified shortcuts available. If each saved just 1 minute @ 10p a minute = £96million. Many calls from mobiles cost over 40p per minute. Please Press 1 is free to use, and saves people money on expensive call costs. The Please Press 1 website (http://www.pleasepress1.com) helps users to quickly ‘Press Ahead’ through the menu options to the service they require. The website displays the menu options available, often shortening calls by several minutes, saving time, expensive call costs and much frustration. We believe that good customer service should come as standard, and that this should extend to the phone menu systems that customers have to navigate. Our aim is for companies to give much more consideration to their customers when designing these menus, by making them as simple and quick to use as possible.